You can listen to the song in Japanese here. Their hearts’ blood dyed its ev’ry fold. In terms of cultural history, this song, that here so captures the remarkable transformation witnessed on that first postwar May Day in Japan is a good example of one that has really travelled well with international revolutionary culture (beyond the well-known anthem the Internationale). Searching on inter-tubes with Mr. Google reports that it was sung at conferences of the British labor party, by Chinese communist anti-Japanese partisans as early as 1931, and that it is a popular pick in North Korean song contest and among South Korean protesters. The Korean version of the song, 적기가 (赤旗歌), can be heard sung at the climactic close of the 2003 movie Silmido based on the events surrounding Unit 684. Imagine the faces of Japanese police watching the protesters that day in 1946 as they listened to the song, even as their ranks were being purged, mostly, of the Special Higher Police whose very job it was to arrest and ideally convert (転向) anyone who were poisoned with such “red” thoughts. Of course, with the “reverse course” only a year or two later, at least some of the smiles of the revolutionaries would be wiped away as the force of the US occupation turned against the Communist threat. Before the miniseries, there was…. I’m not sure when my family got this game, but I remember playing with it in the late 70s. 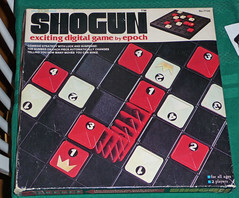 Though Shogun is described as a “digital” game, there’s no electronics involved: magnets in the board turn the dial in each piece until a number shows in the window; that number is how far the piece can move next time. 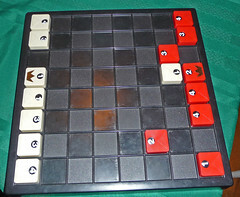 The pseudo-random element takes some of the strategy out of the game1 and so it moves pretty quickly. Below you can see a rare early checkmate — most games involve a lot of piece exchanges before checkmate is on the table — that my 7 year-old managed to pull of in his third game. The numbers swinging around in the pieces is quite enchanting, especially for kids. The game seems to have been invented by a Japanese, but I’m not sure it was ever marketed in Japan. Clavell’s Shogun came out a year or so before this game did, so it’s likely that the title would have been attached to anything with a hint of Japaneseness about it. The association of ‘Japan’ with ‘digital’ is interesting; the use of ‘digital’ itself is an interesting cultural moment, the transition from ‘transistor’ to ‘digital.’ It’s got to be early in the analog v. digital wars, and the term is clearly being misused, as this is a patently analog game. 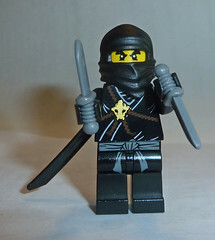 Like “Shogun,” “digital” is a marketing device intended to invoke emotional responses rather than being descriptive. I almost didn’t check Chris Bradford‘s Young Samurai: The Way of the Warrior out of the library when I saw it, but some instinct told me that it was something I should read. Perhaps it was the realization that Young Samurai was the first book in a series — oddly, though, there was no information on the other books1 — and therefore likely to have some serious publicity support from the publisher. Perhaps it was the realization that the publisher was Disney/Hyperion, which more or less guarantees a pretty substantial distribution and readership. Perhaps it was the hope that I might find, finally, some historical fiction worth recommending….. The book is about a young English boy who’s shipwrecked in Japan in 1611, and gets adopted by a samurai family, while being stalked by the ninja pirates who killed his father and crewmates. So it was a bit Karate Kid and a bit of the story of Will Adams (more Samurai William than Shogun); nothing surprising, really, but all a bit familiar. Aside from fairly predictable ahistorical elements,2 commonplaces of martial arts fiction, and the implausible interpersonal relationships, nothing out of the ordinary. Say hello to your new robot overlords! I don’t often get unsolicited books with handwritten notes from the authors, unless I worked with them in some way. What was even more surprising is that the book came to my new office before I was even done unpacking! That’s pretty spiffy service. The book had blurbs from Maxine Hong Kingston and Liza Dalby, which was promising. The book was about The World of Tea, and centered on an orphaned American taken in by a prominent Japanese family; not so promising. The author, Ellis Avery is an Adjunct Assistant Professor at Columbia in Creative Writing, and a five year veteran, we’re told in her bio, of tea ceremony training. Well, most of my fun books were in boxes, so I did read The Teahouse Fire, and since it is about the bakumatsu-Meiji era, I feel I should say something about it. The New York Times is reporting on tensions between the Dojinkai and the civilians living in the neighborhood of their headquarters. Two features of this are worth noting in the context of the Samurai course. First, the Yakuza are widely acknowledged to be one of the last, greatest bastions of feudal samurai concepts of honor and the utility of violence; comparing the modern yakuza to medieval samurai is shockingly fruitful. Second, the social order represented by the neighborhood association is a modern incarnation of the horizontal alliances described by Berry in The Culture of Civil War in Kyoto, the ikki as described by Ikegami, and the goningumi of the great Tokugawa order. Late Update: Going through old email, I found this McNeill Adelstein report on the current state of yakuza. I was surprised to see that the 1992 law had so little effect: when I was in Japan in ’94-95, it seemed like it had done some good. I hear through the grapevine that the organizers of Otakon, the huge anime/manga/pop culture convention held every in August in Baltimore, are looking for academic papers and panels on East Asian art, history, and culture to round out their offerings. Interested parties should contact Omar Jenkins, Head of Programming. So I’m grading my latest World History quiz, and one of the terms is “samurai.” Being a two semester World History sequence, I didn’t spend a lot of time on the samurai — I had one day to cover pre-1500 Japan and Korea — so the answers were mostly based on the textbook (loosely) or people’s prior understandings of the term1 or on Wikipedia.2 At some point I got suspicious and looked up the glossary definitions at the back of the textbook.3 Most students don’t use it, but sometimes they think it’s a good short-cut for the short-answer identification quizzes I give. It’s a viable suspect. Yeah, that’s it. No chronology, no economic or political context, and an undefined foreign term at the heart. A quick survey of the rest of the glossary reveals that most of the other definitions are: a) longer; and b) better. Not all, mind you. Yeah, I had to check and see if they had, in fact, defined that foreign term. Aside from the proununciation error, it looks…. Oh, the Japanese samurai… as opposed to samurai elsewhere? “Honor” is a pretty vague term, too. Again, no chronology, no authorship, minimal context. I know it’s a minor point, but this text is in its fourth edition and these textbooks go through what’s supposed to be exhaustive reviews by dozens of scholars. So why does the glossary read like a touched-up Western Civ text?